Are you using Clock Master or Auto mode? I notice the same problem on my machine. btw thanks to all for this great project. Could you please download this into the Gallery? Especially the Globals report will contain informations that I need to reproduce the issue. Please check your Inbox; i've sent it via mail. Is this really the setup which leads to an extremely high BPM rate in Ableton Live? -When choosing Parameter/Trigger Layers with Button C: Holding the button for selecting is fine, but I think it would be nice to select the "Last Selected one" by just pressing and releasing the button. This way it would be easier to toggle between say Note/CC, or Note/Length or whatever you are working on at the moment. What do you think? Would this be possible? -Why is it that when you disable the Vel. layer all notes turn ON? I mean when I remove the Vel. from all layer assignments I get all notes playing C-3, even on the steps where there were no Gates or Notes. Then turning Gate ON/OFF doesn't remove (or insert) notes anymore. I have to manually turn each GP encoder all the way down to remove them. Or turn all Gates ON and then use the ALL function. The ALL won't affect those notes that don't have the Gate ON... it's all kind of weird. Gates and Notes get completely independent when no Velocity assigned. Maybe there's a reason for this that I don't get. -I can't access the Multi-trigger function in Length Layer by turning the encoders beyond Glide. Glide is the MAX, no matter how much I turn the encoders. Is there any Parameter I may have touched that could have disabled this? -The DIN Sync doesn't sync correctly my 606 or my 303. Some clocks get lost or something. I think it may be something about the pulse-width of the clock pulses. Using the Clock output to trigger an envelope doesn't trigger it always the same, sometimes you get longer or shorter notes. Anybody got a TR synced correctly? I have some more questions but I think that's enough for now... :) Thanks a lot!!! vcfool: I'll have a doepferr MSY-2 and a tr606. will try dinsync directly and compare it with MSY-2. I'll keep ya updated. When choosing Parameter/Trigger Layers with Button C: Holding the button for selecting is fine, but I think it would be nice to select the "Last Selected one" by just pressing and releasing the button. This way it would be easier to toggle between say Note/CC, or Note/Length or whatever you are working on at the moment. What do you think? Would this be possible? I already see many dummy bug reports like "Layer selection goes wild when pressing C button" made by people who are not aware about this mechanism. So, I built an alternative solution into Beta13: By pressing&holding Layer C button you can increment/decrement the layer with A/B button. This isn't a complete replacement for your request, but I find it very useful for myself. -Why is it that when you disable the Vel. layer all notes turn ON? I mean when I remove the Vel. from all layer assignments I get all notes playing C-3, even on the steps where there were no Gates or Notes. Then turning Gate ON/OFF doesn't remove (or insert) notes anymore. I have to manually turn each GP encoder all the way down to remove them. Or turn all Gates ON and then use the ALL function. I can't access the Multi-trigger function in Length Layer by turning the encoders beyond Glide. Glide is the MAX, no matter how much I turn the encoders. Is there any Parameter I may have touched that could have disabled this? Multi Triggers have been replaced by the Roll function which can be assigned to an individual layer. Advantage: now multi triggers also change their velocity. the DIN Sync doesn't sync correctly my 606 or my 303. Some clocks get lost or something. I think it may be something about the pulse-width of the clock pulses. Using the Clock output to trigger an envelope doesn't trigger it always the same, sometimes you get longer or shorter notes. Anybody got a TR synced correctly? resp. decrementing with Layer B button. Just quick tried the DIN Sync. TR-606 syncs just fine changing the value to 5. So I updated to Tiger 10.4.11 yesterday and still no luck. My iBook G4 still doesn't see the USB MIDI. Is there any additional install or something that I must do? MB-SEQ V4 shows on the USB tab on System Profiler and mounting the SD Card goes fine too. But no USB MIDI recognized by any application... everything is just as it was with Panther. No, an additional installation isn't required. Do you see the device in the Audio-MIDI Setup Application? Nope. There's only my MOTU FastLane (and IAC driver, and Network), as usual. Already tried Rescan several times before. Then I've no idea. 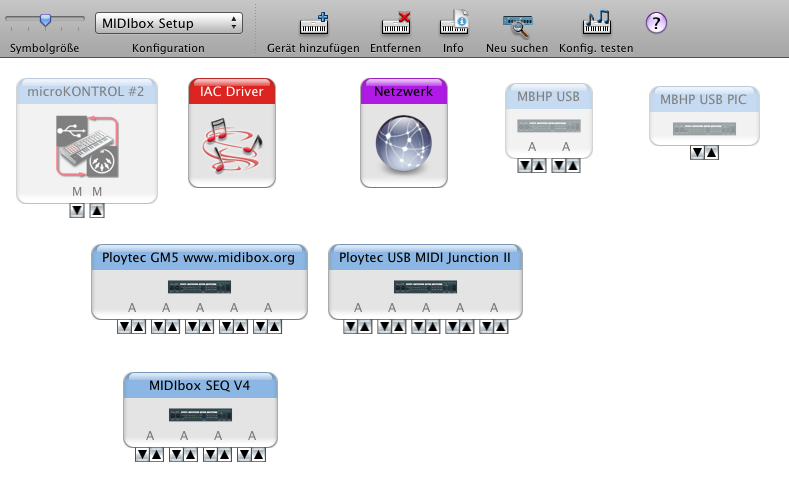 Maybe google helps you to find more informations about using a Standard USB MIDI device on a PowerPC based Mac. P.S. : it could be important that your core module is powered from an external PSU, or from an USB hub with a "strong" PSU supply. P.S. : it could be important that your core module is powered from an external PSU, or from a USB hub with a "strong" PSU supply. Thanks a lot. I've googled a little and didn't found much, I will post here if I find a solution. As the beyond-the-glide mode is still in the V4 Manual I thought it was still working. I didn't knew that Length had some effect in Roll. I have been trying. In V3 you could define the ticks in between repeats quite nicely. For what I undestand, now you do it with the Length, but it only seems to work when 4 or 5 Repeats in Roll are selected. When 2 or 3 it always does the same. How can you do it in Drum Tracks when no Length Layer is there? -In a Note Parameter Layer, and maybe also in a Chord Layer, activating "FAST" could switch the encoders to octave jumps. I'd find that really useful. What do you people think? -In Drum Mode Trigger Layers. Maybe removing a Gate could also remove the ACCent. And inserting an ACCent could also insert a Gate. I have to overwork this section. I didn't knew that Length had some effect in Roll. In order to implement such a feature properly, I would have to overwork the concept how encoder speed is handled, and finding a better concept will take some time. So - only a quick idea or really an important feature? Currently the FAST button exclusively controls the encoder speed (which is handled by MIOS32) - for this feature, I would have to make an exception when a "Note" or "Chord" layer is selected. It will become complicated and error prone once switching between layers, switching to a menu page, etc. have to be considered as well... therefore a different concept would be required which considers certain layer/parameter type specific constraints. Such a mechanism wouldn't allow you to handle accent and gate separately, which is important whenever you are working with "prepared grooves", which are starting with a small number of gate triggers, and are enriched by more triggers (or at the end: all steps triggered) while the sequence is playing. I get use of this possibility very often to vary the patterns during a session. You could simply trigger your drummachine from a J5.A0..A7 gate, controlled from a dedicated track which plays 16 notes at the desired clock rate. The clock rate is defined by the clock divider value and normal/triplet mode. Btw. : is any Mac user interested on a BLM_SCALAR emulation? 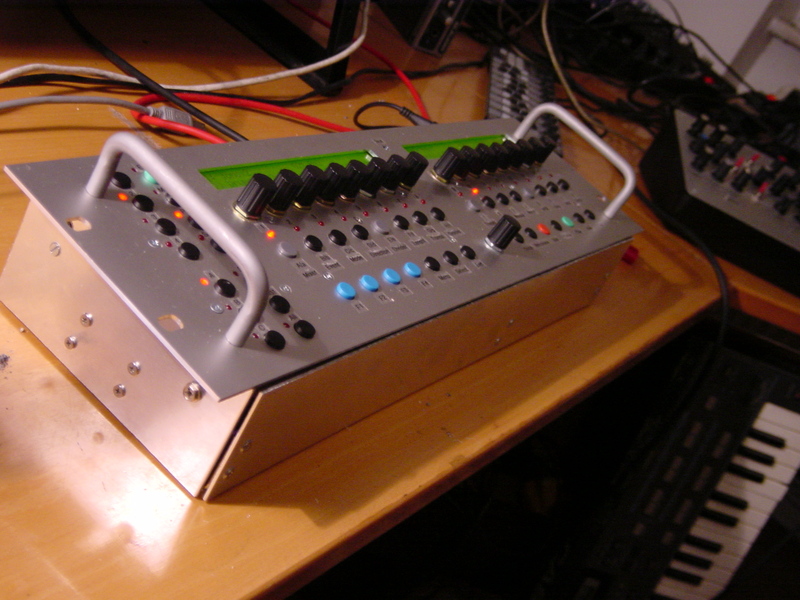 The application communicates with your MBSEQ via MIDI. Planned features: track editing, drum pattern editing, piano roll editor, pattern selection, mixer control, VU meters, etc.. all implemented in the MBSEQ firmware, the BLM_SCALAR application only acts as a stupid display/data entry device. which is real fun using the datawheel as some sort of scratchpad. Then I thougth I could stop or pause the sequencer and use the SCRUB function to scroll through the pattern. But I had to realize that using the SCRUB function always causes the SEQ to start. Is there a special reason for this behavior? Not really, it should work in pause mode. I will check this sooner or later. o prepared support for MBHP_BLM_SCALAR. The matrix should be updated automatically. Try different dimensions - 64x16 is a really useful configuration. Currently we have display buttons for Triggers (e.g. Drum patterns), Tracks and Patterns. One function that I'm planning to add next is the possibility to display Accents in the trigger page with the Red LEDs, and to activate accent by pressing "Triggers"+BLM button. Gridracer: it would be interesting if your BLM configuration is still working, since I had to change a lot of code which is also used for common 16x4 BLMs directly connected to the core. Everything seems to work as supposed to, as far as I can tell from a few minutes of testing.